Everyone gets those spam emails with the ‘unlikely friends’ and ‘animals showing love and compassion,’ well, we don’t anthropomorphize here on EL. Let’s examine why exactly these animals form attachments to other species. Scientist Jenny Holland told National Geographic that “in order for the relationship to be sustained, I believe both parties will need to benefit in some way.” And sometimes companionship is all of the benefit a party needs. 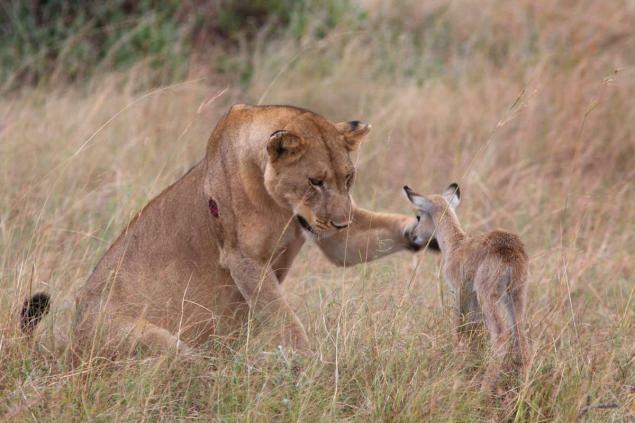 Animals will instinctively take care of their young because they want to pass on their DNA. Holland says “I think there’s some hard wiring in there that leads them to offer care to another animal in need.” When an animal gives birth a hormone is released called oxytocin, which actually helps the mother bond to her young. 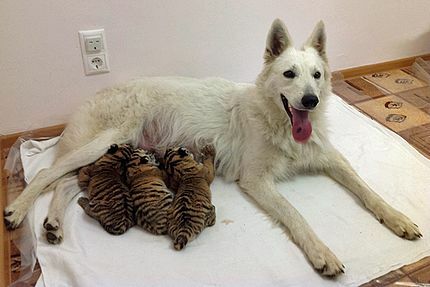 If a mother is presented with a baby of another species while these baby-bonding hormones are coursing through her bloodstream, she is much more likely to take it in, especially if she has lost her own young. 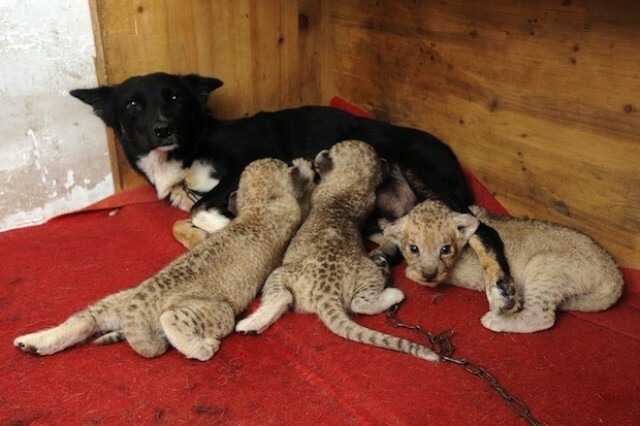 This is shown by a mother lion on Mutual of Omaha’s Wild Kingdom who took in multiple baby oryx after loosing her own litter. Although it didn’t end very well for the babies, who died after a few week because the mother lion was not able to feed them properly, she didn’t give up and adopted several oryx in succession. She didn’t just find the baby oryx though, she would often kill the mother and take the youngster as her own. 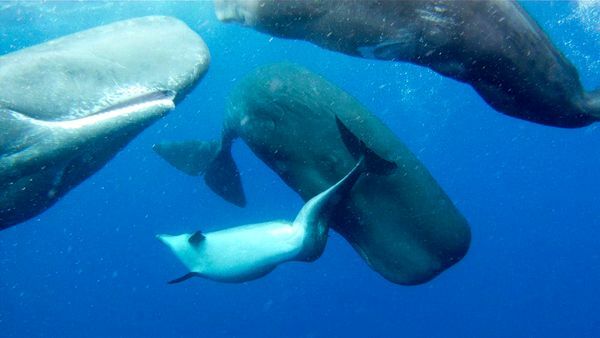 The internet has seen a deformed dolphin frolicking with a pod of sperm whales. The dolphin was born with a severe spinal deformity which scientists believe caused him to be shunned by his own species and find a home within the pod of whales. He is often seen rubbing on the whales and the whales are even seen reciprocating the behavior. Many zoos or exotic animal rescues will also substitute parents or young when a baby has lost its parents or if the mother has lost its young to help avoid emotional distress. 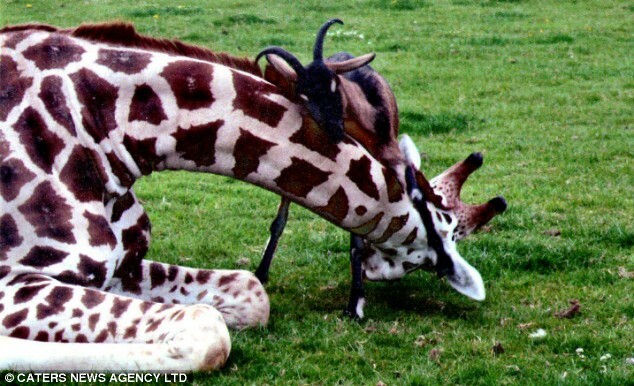 This is how those pictures of tigers suckling on dogs and goats parenting giraffes pop up across the internet. It is much more common in captivity than it is in the wild, because of the meddling hand of man of course!